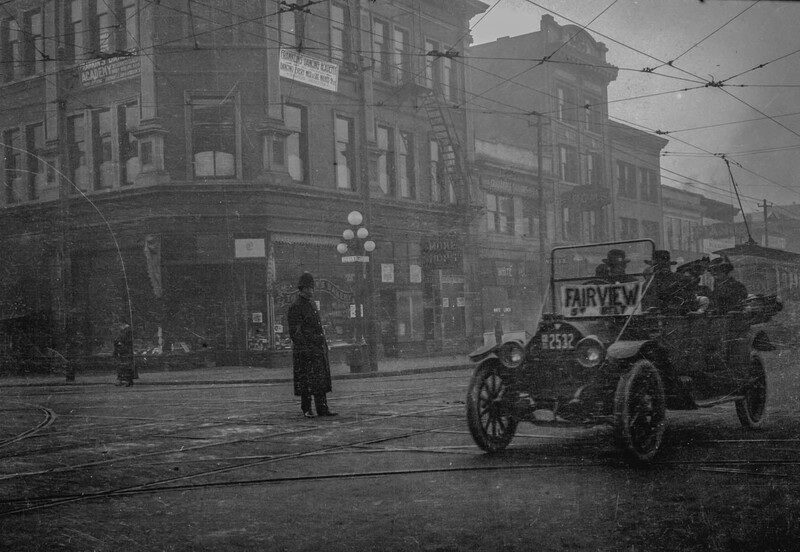 CVA Trans N87.08 – [Taxicabs on Granville Street at Robson Street] 191-? VAIW Note: Franklin Dancing Academy was on the upper floors – see banner notices. The Hall itself may have been on the 2nd or 3rd floor. (The over-exposure of this image has been corrected somewhat). I was recently browsing through a Vancouver newspaper which was new to me: The Greater Vancouver Chinook. The Chinook seems to have run from 1912-15, then briefly (1915-16) as the Saturday Chinook, and still later as The Standard (1916 and later). The principal readership appears to have been people living in the Cedar Cottage area in East Vancouver and east of there (as far east as Edmonds in Burnaby). The Chinook is available in digital form at UBC Library’s Open Collections. The meeting at Franklin Hall, Granville Street, corner Robson Street, on Sunday night was a magnificent success. Over 300 people attended in spite of the bad weather, and the program of orchestral music given by an orchestra numbering 20 included selections from Mayerbeer, Haydn, Gounod and others. . . .
My initial surmise from this report was that Franklin Hall might have been part of the recently-renovated “old” Orpheum complex (formerly the Vancouver Opera House at NW corner of Granville and Robson); it seems from the write-up as though Franklin Hall had been suitable for smaller, more intimate performances and audiences. But I was wrong about its location. Franklin was actually the building kitty-corner to what had been the Opera House, located on the SE corner at 640 Robson (Lennox Pub and Payless Shoes are on the site today). I’m not certain what year the building shown above was constructed, but I suspect it was in the late 1890s. It seems to have been demolished in the 1920s to make way for the two-storey that is there today. CVA maintains that the two-storey was “demolished” in about 1972, but I think that the work which they interpreted as demolition was, in fact, renovation. The give-aways are the window casings which appear the same today. “Franklin Hall” was known by that name for a remarkably brief time; roughly 1912-1919. Before then, it was called the “Elks Hall” (presumably named after the men’s fraternal group of the same name) and post-1919, the space was occupied by the dancing school called in some sources “Vancouver Dancing Academy” and in others, “Franklin’s Dancing Academy”. Just who was the “Franklin” in “Franklin Hall”? That is one of those niggling historical questions that may never be fully resolved. For what it’s worth, though, I’m going to lay my money on “Franklin” being W.E. Franklin (WEF). He (typically only males were referred to in city directories of that time solely with their initials) was shown as a “music teacher” at 640 Robson in the 1913 city directory. In 1917, WEF appeared in the “names” section of the directory as the instructor of the dancing academy at that address (the Dance Academy didn’t appear at 640 Robson in the “streets” section until 1920). Just who WEF was, I have no idea. He was shown as residing at 640 Robson, in addition to working there, around 1919. So if he was, as I suspect, the chap after whom Franklin Hall was named (albeit, briefly); it seems unlikely that he was a wealthy Vancouver ‘mucky-muck’. I suspect it was a matter of convenience to refer to the hall after Franklin. If you are going to be having events that feature music by the likes of Haydn and Gounod, it must be admitted that “Franklin Hall” sounds higher class in advertising copy than “Elks Hall”! This entry was posted in music, theatre/vaudeville/cinemas and tagged 640 Robson (at Granville), bc, Elks Hall, Franklin Hall, Greater Vancouver Chinook, history, vancouver, W. E. Franklin. Bookmark the permalink. William E Franklin, musician, was living in rooms on Davie Street in 1907, which seems to be the first year he’s listed as a musician in the city. Franklin’s Orchestra played for the Butcher’s picnic that year. In 1910 he was living at 542 Granville, and his orchestra was performing that year, in 1911 and in 1914, so he was a well-established musical organizer over a number of years. In 1912 the orchestra played in Delta at several dances, where it was said that the “music was among the best ever heard on a local dance floor”. While there seems to have been a ‘Franklin’s Orchestra’ playing in the city in 1905, there’s no musician called Franklin listed. There was a W E Franklin living here that year – he was a salesman, and in 1906 a dairyman, so it’s possible it’s the same person establishing himself as a musician while working elsewhere. Assuming it’s the same W E Franklin who later taught dancing, he was still in the city into the 1920s – he was shown from 1917 to 1921 living at 1117 Granville, where he was a dancing teacher. (The last time I can see him living on Robson was in 1916). He seems to have evaded the 1911 census taker, or was the W Franklin lodging on Granville, aged 42 but with no other details recorded. Thanks very much for these additional details.